We’d love your help. Let us know what’s wrong with this preview of Without a Doubt by Fleur McDonald. Detective Dave Burrows had never even heard of Nundrew in Queensland before. He'd certainly never have guessed that this was where he'd be risking his life. In Barrabine, as Dave's workload skyrockets, Melinda, Dave's wife, is unhappy about being left alone so much to raise their eighteen-month-old daughter. It's not how Dave wants it either, but crimes still have to be investigated - it's what he joined the force for - and he's the only one able to do it. Melinda's interfering father isn't helping. He's never thought that Dave is right for his daughter and he's not shy about telling Dave what he's doing wrong. When things come to a head at home, Dave's policing mate, Spencer, comes up with a plan. To ask other readers questions about Without a Doubt, please sign up. Detective Dave Burrows was settled into his life in Barrabine in Western Australia with his offsider Spencer having shown him the ropes. He loved the rural lifestyle, helping the locals and keeping law and order. The trouble was, his young wife was unhappy. Melinda hadn’t long had their daughter Bec, and although she was now eighteen months old, Melinda continued to be unsettled and restless about her life. Making it worse was the fact that her family lived in Perth and her father continued to p Detective Dave Burrows was settled into his life in Barrabine in Western Australia with his offsider Spencer having shown him the ropes. He loved the rural lifestyle, helping the locals and keeping law and order. The trouble was, his young wife was unhappy. Melinda hadn’t long had their daughter Bec, and although she was now eighteen months old, Melinda continued to be unsettled and restless about her life. Making it worse was the fact that her family lived in Perth and her father continued to put Dave down, insisting Melinda return to Perth with Bec to live with them. She was torn. Without a Doubt is another fabulous romantic suspense – high on the suspense – novel by Aussie author Fleur McDonald. I really enjoy Dave’s character; he’s a normal, down to earth guy, strong, tough and caring. He’s not shy in showing his love for his wife and little daughter, and prepared to do what it takes to fix his family problem. I hope the author doesn’t stop writing Detective Dave Burrows’ story any time soon! Highly recommended. The complete review can be read at Beauty and Lace online. Without A Doubt is engaging and well paced, a read that kept some interesting little twists nice and quiet until the very end but I feel like it wrapped up a little too quickly. I'm left with some questions that I just don't know if I will ever have answers to. Fleur McDonald has a wealth of farming experience in rural Australia and she employs that knowledge to pen a tale of small communities, mustering and stock losses. This is a tale tha The complete review can be read at Beauty and Lace online. This is a tale that travels far and wide, with storylines encompassing both ends of our wide brown land. Dave Burrows is stationed in the West Australian town of Barrabine and the story takes us from there to Nundrew, a very similar town in Queensland. The link begins quite tenuous and circumstantial but the deeper we delve, and the more danger Dave finds himself in, the stronger the links. 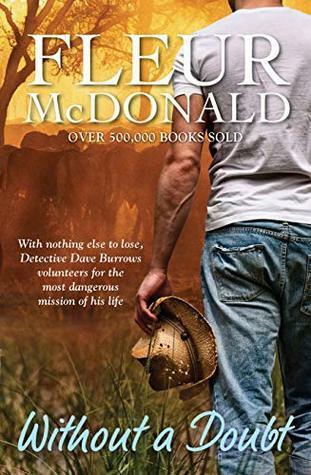 McDonald explores undercover policing and cattle theft with insight and intrigue. Her writing is plausible and the undercover policing aspect was quite obviously well researched. The toll of police work on families is explored with the dangers of everyday policing, before going further into the stress and fear that goes along with undercover work. The complete disconnect with everything about your life to take on a role that is destined to be life changing, every single time. Once again McDonald explores the effects that a major move has on Melinda. She learned to live with the small town, the distance from her family and the commitment of Dave to his work when it was just the two of them but things have changed now that there's three of them. Part of Melinda's settling in was finding a job that she loved, now that she's home with Bec that outlet is not there for her. Raising a baby, any child actually, is hard work and you need support. It is certainly a time that you feel the distance from your family and it doesn't help when that family is forever rubbing that distance in, making sure you know that it could be easier if you were closer. That disconnect from family, from the community you live in with the break from work and the rigorous demands of a young child can definitely impact your happiness and it takes work to overcome that. I think McDonald has explored this aspect relatively well though we read from Dave's perspective so never quite make it all the way into Melinda's head. Without a Doubt is another fantastic read, another trip back in time to learn more about a young Detective Dave Burrows. This is a Detective Dave Burrows story so it is linked to other novels but I'm not sure it's really a linear type series that you have to read in order. The previous release is Where The River Runs which we featured as a book club read but I haven't quite got to yet, much to my dismay, and that features Det. Burrows but I'm not sure of it's time setting. Fool's Gold is the earlier release which is set in 1997 when the Burrows couple first arrive in Barrabine so if there is any book to read before this one, that's probably it. Having said that, I think Without A Doubt works beautifully as a stand alone. This is “Without a Doubt” one of the best books I have read. I love the storyline following Dave Burrows on his life journey. From the ups and downs working in the Police force to the ups and downs in his marriage this book has kept me riveted and wanting to know more about Daves future. I can’t wait for the next book in this series! Am halfway through and it is another can't put it down..... I love the mystery and the real life small town life. A great early Dave Burrows story. After growing up on a farm near Orroroo in South Australia, Fleur McDonald’s first job was jillarooing in the outback. She’s now closely involved in the daily management of the 8000-acre station she and her family live on near Esperance in Western Australia. Fleur is the author of the bestselling novels Red Dust, Blue Skies, Purple Roads and Silver Clouds. Fleur chats about her daily farming life After growing up on a farm near Orroroo in South Australia, Fleur McDonald’s first job was jillarooing in the outback. She’s now closely involved in the daily management of the 8000-acre station she and her family live on near Esperance in Western Australia.